- Comprehensive player stats kept and updated after each match. - The widest range of historical stats and records for players, clubs, leagues and coaches ever seen in an Australian football game. - Game automatically scales itself to your desktop screen resolution and is playable in windowed or full screen modes. - Meticulously designed user interface, built on Windows Vista's next generation presentation foundation looks fantastic while providing unrivaled usability. - Choose to play games through the strategic real-time match day, or skip over them with a quick simulation. - Assistant coach automation of most tasks is available. - Begin games with existing squads or start out with a complete fantasy draft - An editor is included which enables to customise your game as you see fit. - Includes all major state leagues as well as many country and local leagues from which to scout out potential draftees. - Father/Son players are draftable under current rules. - Accurate report and tribunal system. - Clubs begin with realistic financial states and resources. Not all coaching challenges are equal. - Detailed scouting model - send your scouts out to junior or regional matches to watch players. - The more your scouts see of certain players, and the better the Scouts' ability, the more accurate their estimation of that players attributes and potential will be. - Careful management of your clubs recruiting department may well give you the chance to pick up a late round gem. Keep an eye on your teams statistics throughout the course of the season to determine your in form players in the reserves. There might be a warranted rookie listed player elevation, that could go on to win a brownlow in the future! In game injuries can be as serious as determining a WIN or a LOSS for your team. Make sure you include depth when going into a match to cover a serious injury. Keep all of your medical staff at the top of their class in sports medicine, to help your star players get back out the track and back into your starting 22. Throughout a match there is so much happening that not even the head coach can keep up with every move needed. With the help of your assistant coaches and club doctors, you can receive helpful tips during matchday. Tips as regular as a simple rotation - right up to a match winning move that you might not have even considered. - Player movement is all animated in real time on an overhead view. - Other animated objects include the umpires, runners and of course the ball. - Set your team's game plan from a broad selection of options. - Text based commentary is provided to help follow the play. - Keep tabs on the wide range of in game stats readily available. - Fatigue also plays a part and will affect player performance as it builds. - Medical staff give reports on player injuries. - Clever AI coaches will provide plenty of challenge. - Give your players specific instructions on where they should be, and how closely they should play their opponent, or give them license to roam free and rack up posessions. - Once play is under way, send your runner out with instructions. - Dynamically changing weather conditions affect gamepley and add to the challenge. - Assistant Coaches provide insight and give suggestions. Create your own custom images for your existing and newly recruited players. Give your lineup a professional look with images to each member in your squad. Setting up images is as easy as 1,2,3, Once you have created your image, simply paste it into the Payer Images folder in your installed directory. Then click on one of your players in your list and tada, the image should appear! You dont even need to quit your game or reboot your computer. You never know the next new recruit could captain your side to a premiership. Wouldn't you like to be able to show off that player to your friends? Winning premierships is what coaching is all about. It's what seperates the good coaches from the great coaches. Work hard to build your club into a winning formula. 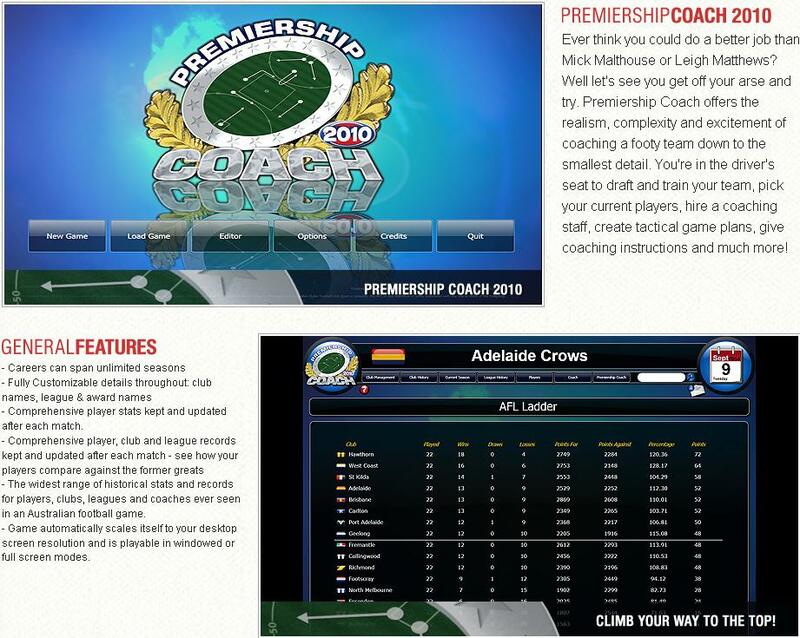 Build your club a strong list and have a crack at that elusive premiership. But dont settle for one premiership. Make sure you have built your list into something you can build a winning dynasty on. Take your coaching name into an elite legendary status.